The book, co-written with ESPN.com columnist Gene Wojciechowski, who happened to be classmates with Finebaum at the University of Tennessee, is structured around the 2013 football season. Each chapter begins with a dateline, indicating where Finebaum was that particular week, and a blurb covering the then-current status of the top contending teams. Rigid commitment to this structure– one soon develops the strong feeling that Finebaum actually completed these chapters during the indicated weeks– leads to some awkward results. For example, his inclusion of his own mid-season rankings and predictions rings empty and slightly embarrassing given that readers know how the 2013 season played out. 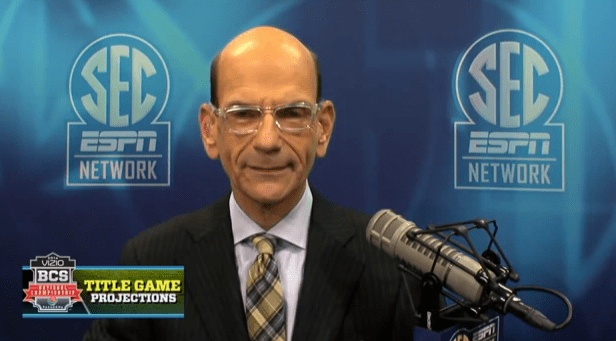 Those sorts of glaring moments are few, though, and Finebaum actually does a conscious job of returning to many of the projections and prognostications (his and others’) he introduces after the relevant games have been played to demonstrate the insight and intelligence of colleagues and peers he respects. Finebaum also uses in-season moments to reflect on his own personal background, and give readers a few small peeks behind the ESPN College Gameday scenes. In a post-publication interview, he admitted that he found it difficult to expound upon his personal life in the book. We do learn about his professional background as a newspaper journalist and his transition to radio, along with a smattering about his personal life. Of course, having a father who died when you were young and a mother along with whom you don’t generally get will limit exposition with regard to the latter component. Still, even if we weren’t going to learn whether he really believes the things he says on the air,* it would have been nice to see him make the connection between his socially challenging family life as a New York-connected Jew raised in Memphis (all things he identifies as important) and the personality who helms the SEC’s everyman airwaves today. One nice feature of the structure of the book was reliving two of the best games of the year: Auburn’s comeback win in the Iron Bowl, and the BCS championship game through Finebaum’s well-attuned eyes. For this reason, this book is a nice and easy read for college football fans looking to get into the mood for the 2014 season. (Yes, my book review is a little late for that precise purpose, but that’s nothing new for me.) I did the same thing last year, thanks to the kind gift of the more investigative, and still very relevant, book, The System, which I continue to share and recommend. Whether it be a serious journalistic expose of the NCAA or Finebaum on the printed page, there’s something to be said for entering a college football season with a recap of the previous one fresh in your mind. Unlike The System, Finebaum’s My Conference Can Beat Your Conference does not make a case for being essential reading. Frankly, it does not even directly address the subject introduced in the title (which the author acknowledges toward the end). Finebaum has some words for Ohio State (Urban Meyer), Michigan, and Michigan State fans, as well as Pacific Twelve fans, but if you (and not me) are an ordinary SEC fan, then this is exactly the book you’d expect it to be. ** Quick and easy to read, you’ll feel like you know PAWWWLLLLLL a little better, and you’ll be geared up for the 2014 season. * I think this is what I ultimately want from Finebaum and was hoping this book would deliver. Because his success is dependent upon his marshaling of his core demographic of callers, as he openly acknowledges, however, such a reveal now seems unlikely. ** The thing is, the SEC, and the state of Alabama, really is genuinely and objectively relevant on a national scale these days. Finebaum, along with people like Clay Travis, really is hitting this thing at almost exactly the right time. I have this sense that we have already, if possibly only recently, hit Peak SEC. The Pacific Twelve is climbing, an ACC member (really, an SEC reject) broke the SEC’s BCS run, other conferences are realigning and supplementing, and the BCS era is over. Still, the SEC’s tail may be a long, Federer-esque one, and Finebaum and Travis are getting on the national scene while the getting is good. This entry was posted in ALDLAND and tagged acc, alabama, auburn, awful announcing, bcs, clay travis, college football, deadspin, espn, florida state, gene wojciechowski, new yorker, ohio state, pac 12, paul finebaum, radio, sec, sec network, tim tebow, urban meyer by AD. Bookmark the permalink.